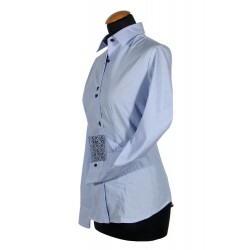 Light blue shirt with straight collar. Floral blue hidden contrast, blue buttonholes and white buttons. 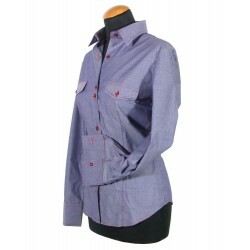 Light blue woman's shirt with straight collar. Floral blue hidden contrast, blue buttonholes and white buttons. Langarm-Slim fit Hemd mit kragen straight. 100% Baumwolle.